Will Power is third place in the championship right now. In a typical year this wouldn’t be surprising, but considering that he has failed to finish three of the nine races so far this season, this is an amazing feat. With 321 points, he sits just 13 points shy of second place Rossi and 46 back from the championship leader Dixon. So how’s he doing it? First, let’s address the DNFs. In the three races Power didn’t complete, he finished 22nd, 21st, and 18th. Those results gave him a combined 32 points or 10 percent of his total points through nine races. This means he has averaged 48 points in the other six races! Even once you account for Indianapolis’ double points, that’s still an average of over 40 points per race – this is equivalent to a second place finish. Power has been on an absolute tear in the races he has finished this year. Despite completing only 85.8% of the laps run, the least of any driver in the top ten, he is third in the championship. In the races he completes, he is averaging a finish of 3.8. In those same races, he has never finished outside of the top ten and has four podiums. One way to gauge how efficient a driver is on track is by looking at their points/100 laps. The best drivers who have consistently strong results will usually have a high value for this stat. A driver who DNFs a lot but is very good when he’s on track will also have a high points/100 laps. That is the benefit of looking at efficiency in this way–it equalizes drivers who have completed many laps with those who have not. 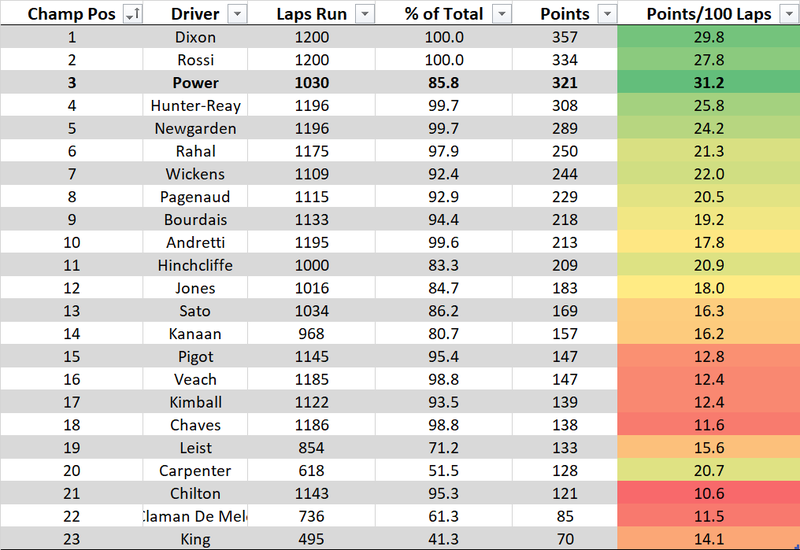 Power’s points/100 laps value of 31.2 is a full point ahead of Dixon’s, but don’t make the mistake of thinking this means Power has been better than Dixon overall: Power would very much rather be in Dixon’s shoes right now with the championship lead. What it does mean however is that we would expect Power to have a stronger second half of the season (in terms of points scored) than the first half. 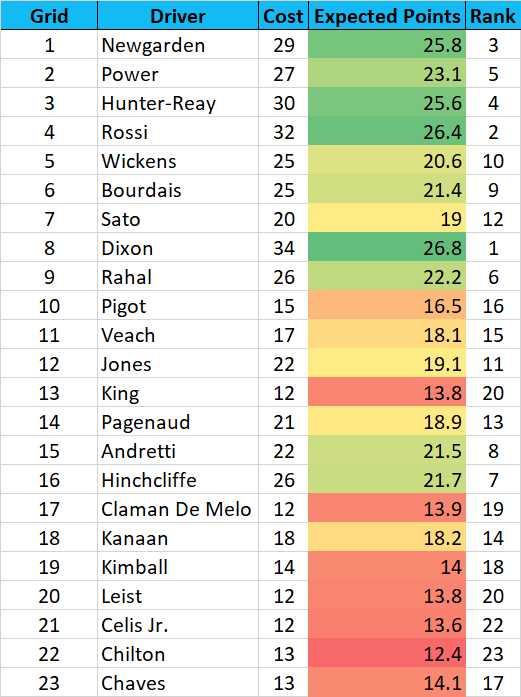 He has been driving superbly when he’s had the chance to, and that shows in his per 100 lap efficiency. Power has not had a knack for racking up DNFs throughout his career. In the last ten seasons, the most DNFs Power has had in a season is four in 2017. The odds are he won’t have as many DNFs in the remaining seven races as he had in the first nine, meaning he’ll have more time to be on track and generate high points-returning finishes. Look for Power to make a second-half season push towards the top spot on the championship table with the way he has been driving.